Arsenal right-back Hector Bellerin has aimed a little dig at Alexis Sanchez following his controversial transfer from the Gunners to rivals Manchester United this January. The Chile international left the Emirates Stadium under something of a cloud after rumours that he’d fallen out with a number of his team-mates and had become increasingly unpopular with the club’s fans as well. 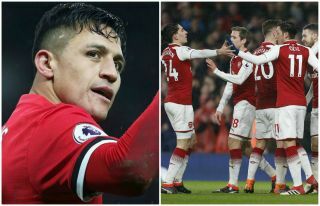 Bellerin, speaking at the Oxford Union, admitted there was some tension with Sanchez towards the end, stating that although he admired the 29-year-old, he could occasionally be too demanding of the rest of the team. ‘Alexis is an amazing player,’ the Spaniard said. ‘One of the best in the Premier League for sure but he is a player who always wants to win. ‘He demands from everyone, sometimes it can be too much. The great thing is he wants to win, to give 100 per cent. While Bellerin was hardly likely to tear into Sanchez completely, this thinly-veiled dig shows how the player’s winning mentality arguably became a hindrance for him at under-achieving Arsenal. The former Barcelona man will now feel he’s left a struggling side to compete for the major honours he no doubts harbours the ambition to win before the end of his career.